Great value for these plates! Their clean and simple lines were perfect for what we needed. They also have a good weight to them. We will definitely be ordering more soon. Including a set of six, these 'Red Vanilla' dinner plates are ideal for serving a variety of cuisines. Constructed of porcelain and highlighted with a creamy white finish. 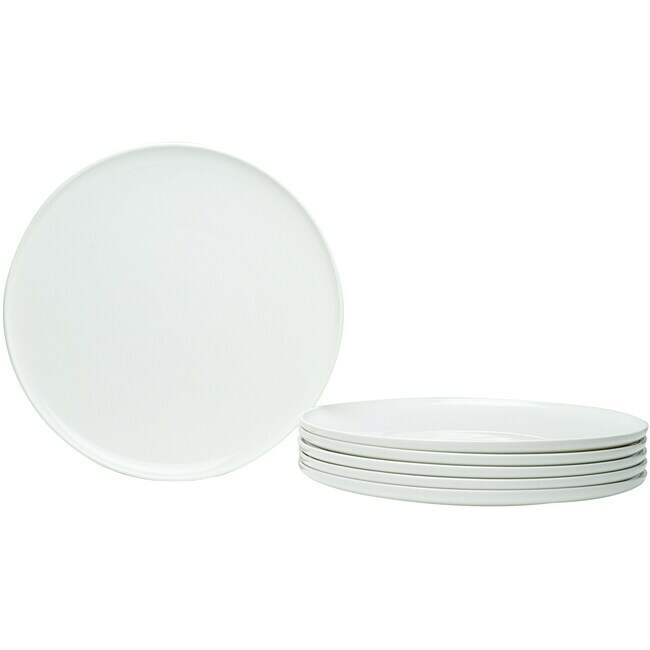 These six dinner plates from Red Vanilla are great for serving everyday dinners or having fancy dinner parties. The creamy white color goes with any dining-room decor you might have. For convenience, these plates are safe to use in the dishwasher, the microwave and the oven at up to 200 degrees. I was looking for a sturdy, classic plate that I could combine with some of my existing dinnerware. This does the trick. Fits into the dishwasher perfectly as well. The 8-1/2" salad plates are just big enough for us to use as a small dinner plate. We actually use those more. These plates have a weird lip and kind of a circle inside them. I was expecting them to be simple, smooth white plates but they are really rather strange looking. Seem to be good quality. Too heavy ($$$) for me to bother returning. My Second Set! Love these white basic dishes! I ordered Red Vanilla dishes from Overstock years ago. They are simple and beautiful and held up well! I needed to add to my dinner plates, so I ordered this set. They are nice and big! You won't be disappointed! They came packed in double box and arrived perfect! These plates are the perfect backdrop for food. Nice shade of white, small rim around the outer edge with a large eating area. One very small drawback is when the plates are stacked, it is just a bit difficult to remove a plate from the stack because of that rim. Just something to get used to I suppose. The quality and craftsmanship is perfect. Great job of packing them to arrive safely as well. Finding everything to meet my needs. had a set of these dinner plates that I purchased from a department store but needed addiotnal for holiday dinner. Overstock came through again when I was searching for them. Thats why I shop the website. Meets all my needs. Thank you Overstock for your variety of good products. I absolutely love these plates. They are great for every day dining, but also look nice enough for guests. All around great plates. I've been using these for a few months now and they have held up perfectly. (My kids put the dishes away so that's saying something.) They are a clean, elegant minimalist design that can easily be used for everyday and formal dining. I am planning to purchase a few additional pieces once they are back in stock. Order came on time , very well packed, I like it this plates, only one concern, I thought this one is more deeper then I received. You can not make judgment only by picture. I order set of two,so total 12 plates. Locking for matching bowls. This plates are stunning. Very classic beautiful plates. They can be dressed up or dressed down. They would make an excellent wedding shower gift! "Do these plates sit flat? What is the overall height of them? Thank you." Hello itsnotevenleatha, the plates do not sit completely flat they are slightly concave. Each plate is .5 inches in height. Thank you for shopping with us. "Can you please advise where these dishes are manufactured? Thank you"
Hello emanj, thank you for your inquiry. These plates are manufactured in Thailand. "does the plate have a decorative border?"